Westminster Abbey’s records tell us that the School Gateway was erected in 1734. It is noted in the accounts that the Dean and Chapter allowed £50 towards the cost “provided that the other part of the expense be borne by voluntary contributions.” An earlier door was removed to make way for it. 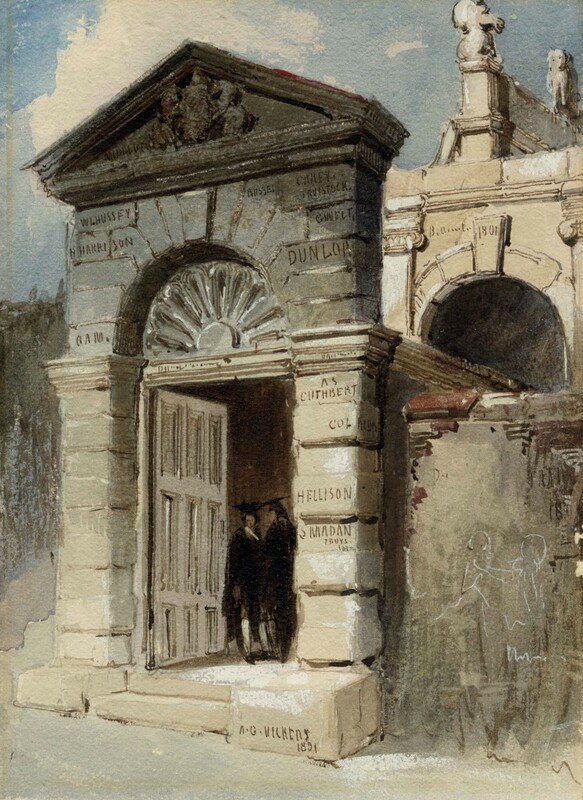 During the 19th Century the Gateway was thought to have been designed by Inigo Jones, but the date of its construction makes this highly unlikely. 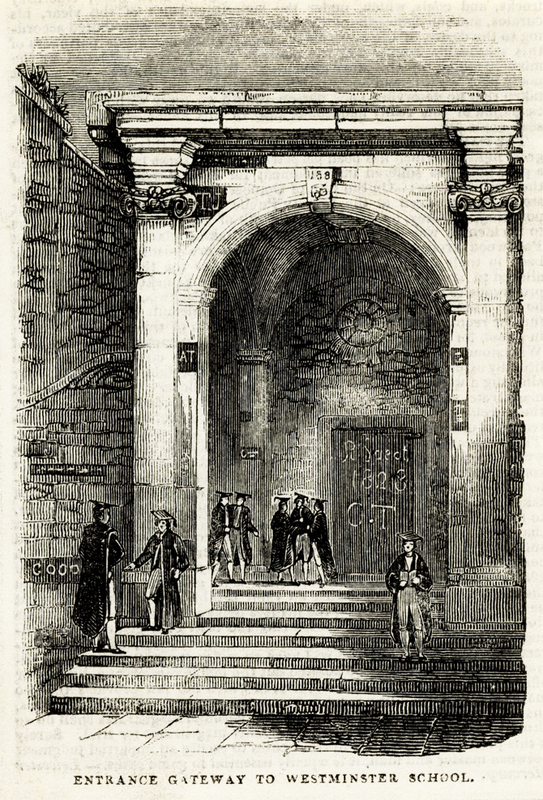 It may well be, as John Sargeaunt suggests, the work of Lord Burlington, especially as it was at that time intended to also serve as an entrance to College, which the latter designed. Today, it is often colloquially referred to as ‘Burlington’s Arch’. 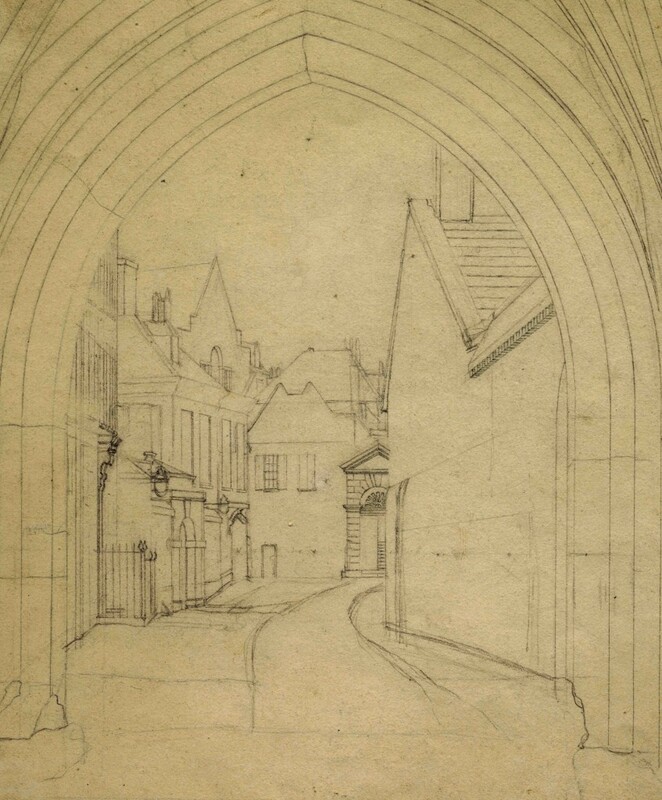 At the time of the Gateway’s construction Little Dean’s Yard was originally little more than a narrow cobbled passageway, leading from Dean’s Yard, under what is now Liddell’s Arch, to School – a path still marked by the small square cobble stones which follow that route across Yard. The stairs and portico behind date from an earlier period. Research by former Archivist, Eddie Smith, strongly suggests that these are the work of Old Westminster, Robert Hooke, working in collaboration with his former Head Master, Dr Richard Busby. Of course, Hooke and Busby worked together on a number of projects, including the black and white chequer board marble pavement in the Quire of Westminster Abbey in the 1676-7. In an affidavit produced by Robert Hooke in 1697 to help prove a codicil to Dr Busby’s will, Hooke stated that he ‘assisted him the said Dr Busby in the beautyfieing of the School & Colledge at Westm’. The first work under Dr Busby (probably predating Robert Hooke’s involvement) on the area leading to School appears to be in the 1660s. In Westminster Abbey Muniment Room there is a receipt for 94ft of stone stairs in 1669 (WAM24833); there is also a receipt in Busby’s Account Book for Dec 17 1664 for £4-0-0 of John Angier for the ‘new staire by the schoole’. Nearly 20 years later the Portico appears to have been built. A carpenter’s bill dated 25th September 1682 includes a charge of ‘£30-0-0’ for the ‘second portico’ (WAM 66886). The whole bill is £93-7-10 and includes cornice, ceiling dome, guttering. It is signed by Scarborow and then approved by Hooke (‘I have examined and computed this bill and find it to amount to…October 1682 . R Hooke’). On the reverse of the bill is written ‘Mr Plucknet his Accts of Ye Church of Willen & The Museum at Schoole’. ‘The Museum’ is the name given to the Busby Library, to which the Portico leads. The strong case for Hooke’s involvement is further supported by the signature of Scarborow on the bill. Jaques Heyman (Hooke and Bedlam, Hooke 2003 conference, p 167) says that John Scaborough was a member of Wren’s office and was used by Wren and by Hooke as a measuring clerk. This reciept and other in the Abbey’s muniments show ‘Scarborow’ is acting as a quantity surveyor. 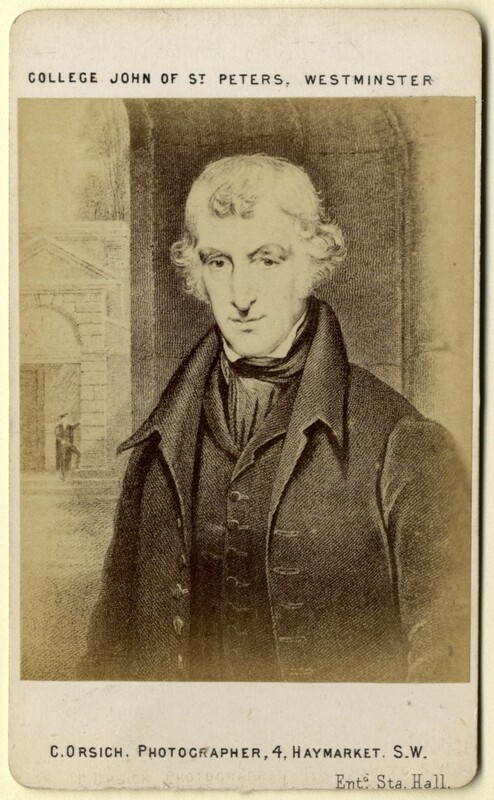 SIR,—The inquiry of a correspondent in a recent number of your paper for some particulars of the coat-of-arms on the gateway of School ‘ induces me to trouble you with a few lines, as I am in possession of some facts, known, perhaps, to few living Westminsters, in relation to the subject of his query. The griffin,’ as he properly calls it, is an error of the scupltor for the dragon,’ which in the Tudor era occupied the position now assumed by the unicorn, the dragon being the representative of Wales, whence the House of Tudor were derived. The difference between these two fabulous creatures is pointed out in any book of heraldry ; but the confusion survives in the so-called ‘ griffin ‘ at Temple Bar, which is in reality a dragon. But the whole armorial display bears to the experienced eye marks of quite modern design and workmanship. A close observation will detect the traces of names carved behind the shield, and how this came to pass I will now relate. Bedford’s story appears to be correct in every respect. Sir John Edmond de Beauvoir, known as John Browne whilst a pupil at the school, was indeed MP for Windsor in 1835, before succeeding his father as Baronet. The names carved behind the arms have proved difficult to identify. Only the initial and final letters are now visible. However, the oil painting, from which the print of College John (featured on the left) was drawn, does contain the full names. 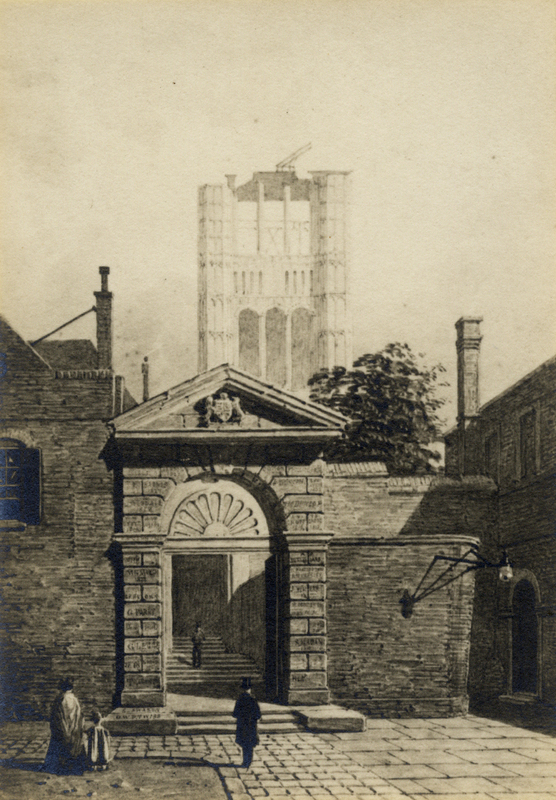 The School Gateway has witnessed many changes, the clearing of Little Dean’s Yard, the demolition of Turle’s House and the fire which destroyed the Palace of Westminster and the construction which followed. The image on the left depicts the arch with the Victoria Tower partially built in the background. The most recent change to alter the appearance of the Gateway came when the racquets courts, previously to the right of the archway were demolished to enable a view through to College Garden and, in honour of John Carleton, the fountain was constructed.